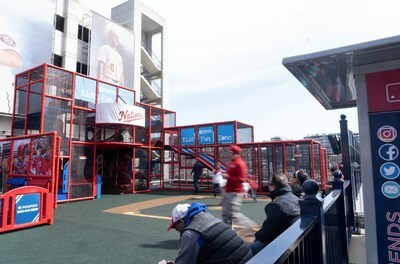 TYSONS, Va., April 3, 2019 /PRNewswire/ -- PenFed Credit Union, the nation's second-largest federal credit union, is continuing its unique and expansive sponsorship with the Washington Nationals Major League Baseball team for the 2019 season. PenFed Credit Union continues Washington Nationals Military Appreciation Section sponsorship providing complimentary tickets to the military community for all regular season home games. Fans enjoy the PenFed Military Appreciation Section during opening day on March 28, 2019. Kids play in the PenFed Kids’ Fun Zone. 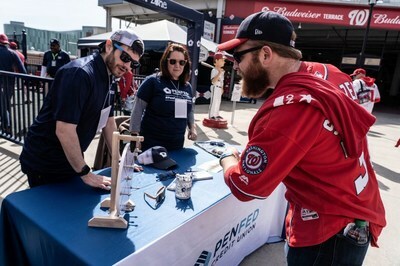 A fan spins to win a PenFed giveaway item during opening day at Nationals Park on March 28, 2019. The partnership, in its second year, continues to center around the PenFed Military Appreciation Section, located in right field at Nationals Park. 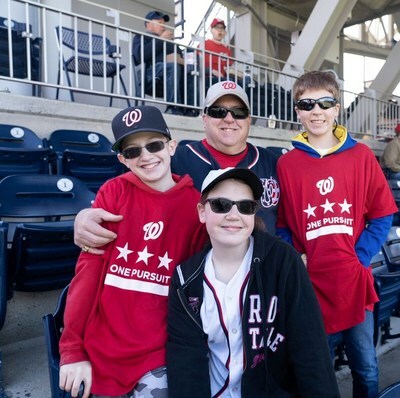 PenFed and the Nationals established a Tickets For Troops program making a select number of complimentary tickets available for military members for all regular season home games at Nationals Park (diamond and marquee level games included). "PenFed has supported the national military community and the greater Washington community for 84 years," said James Schenck, President and CEO of PenFed Credit Union and CEO of the PenFed Foundation. "We are especially proud to show appreciation for veterans and active-duty servicemembers and their families every day at Nationals Park. This is one of the ways PenFed says 'thank you' to all the brave men and women who protect our freedoms." Tickets For Troops are available through Nationals.com/TicketsforTroops. Active duty, veterans, retired, and DOD-civilians can claim tickets online then pick them up in person on the day of the game. A valid military ID or proof of service must be presented on site to claim tickets. PenFed gave 7,100 complimentary tickets as part of Tickets For Troops program during the 2018 season. PenFed Kids' Fun Zone – Expanded this year with a new slide and refreshed look, the play area is frequented by thousands of military and civilian families each season. PenFed Military Appreciation Section giveaways – During select games, everyone in the section will receive a promotional item and "thank you" message. Featured Section giveaways – provide lucky fans with a PenFed novelty hat during four games. Bobblehead giveaway – for the first 20,000 fans attending the September 13 game vs. the Atlanta Braves. Spin to Win – PenFed items for fans during four games this season. The prize wheel will be located outside the PenFed Kids' Fun Zone. "The Washington Nationals and PenFed share a commitment to both honoring members of the military and their families and serving the greater Washington, D.C. community," said Alan H. Gottlieb, Chief Operating Officer of Lerner Sports. 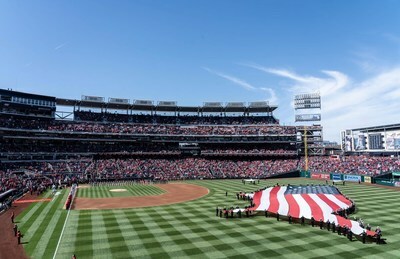 "The Washington Nationals strive to provide the best fan experience in sports and the expanded kids play area and military ticket program both significantly add to our ballpark's exciting game day atmosphere."